The feature is simple to use: right-click on any page and select cast from the options to start the process. 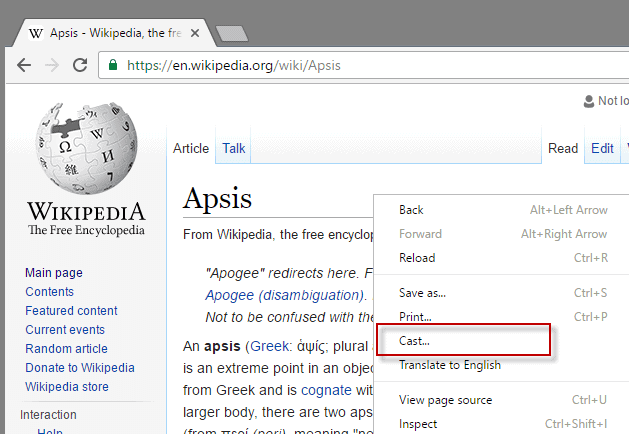 You may select the cast option from the main Chrome menu alternatively if you prefer that, or if right-clicking won't work on the active page. Update: The cast feature is now integrated natively in all versions of Google Chrome, including Google Chrome Stable. Chrome displays a prompt once cast is selected which you use to select the device you want to cast the page to. Information is displayed on first launch which highlights the new Cast experience in Google Chrome. An option to enable casting to cloud-based services like Google Hangouts is listed, and enabled by default. This allows you to share the screen with cloud-based services such as Google Hangouts. This option is only provided if you sign-in to the Chrome browser according to Google. If you prefer not to, remove the checkmark from the preference before you hit the "ok, got it" button. The Cast To listing below the preference lists all compatible devices that you can cast the tab to. The native feature automates mirroring options based on the content and the network quality. These options have been removed, as the system now automatically adjusts quality, frame rate and resolution based upon your content and the quality of your network. Users who prefer to be in control need the Google Cast extension for Chrome for that as it provides them with the functionality. If you need to make adjustments to certain parameters, you need to keep using the Google Cast extension. Interestingly enough, it is also required to enable or disable the casting to Cloud Services from Chrome as the one-time prompt is displayed only the first time. It is unclear at this time in writing if the Cast option is displayed only to users who have used a Google Cast device before. It would be a colossal issue if that is not the case as it would add dead weight not only to the right-click menu but also the main Google Chrome menu. For now it seems that you may use the native option or the Chrome extension for your casting needs. Now You: Do you see the Cast option in Chrome? Google implemented a new feature in Chrome 51 that introduces a Cast option to the right-click menu and main menu of the browser. I don’t have any Google cast device but I do have the cast option in my Chrome browser 52 beta. FYI I do not see Cast using Chrome Version 51.0.2704.106 m (64-bit). Cast option was in Chrome 52, but is NOT seen in latest Chrome 53 release. UPDATE: Looks like the Cast option suddenly appeared in the Chrome 53 menu. (It took a day to appear after installing version 53). OK, it’s available in Chrome 53 also. Nevermind.